This coupon is a great value! 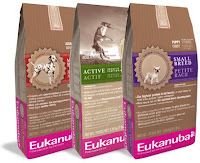 You can head right on over here and fill out the form and Eukanuba will mail you a coupon good for $10.00/1 bag of food! Now, I don’t know what this brand of food normally costs, but when you can save $10.00 – I don’t know if it matters! LOL!